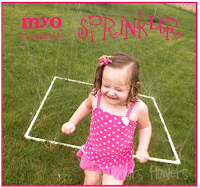 -- What a fun DIY sprinkler! Materials: 10 foot pieces of 1/2 inch PVC pipe, PVC t-joint, PVC hose to pipe connector, PVC elbow joints, PVC cement, PVC pipe cutting tool, drill with 1/16 inch drill bit. What an excellent idea - drip-free popsicles for toddlers! I have seen these plastic Easter eggs at the dollar store in the past - I wonder if it's too late? Materials: Fruit juice, plastic Easter eggs, plastic sucker sticks, large nail and thumbtack, small funnel or piping tip to fill the eggs.